However, sometimes that agreement to a No Fault divorce doesn’t stick. The parties, after getting over the initial shock of divorce, decide they will be adults and agree. They think they can agree to the divorce and resolve their differences. After all, they did manage to get along for most of 9 years, have two kids and bought a house. What could go wrong? They even searched online and looked at divorceyourself.com. The No Fault agreement gets derailed when the Husband realizes he will have to pay 20% of his income towards child support, plus health insurance and alimony. He realizes it’s a lot of money. The Wife gets squirrely when she realizes that her half of the retirement account is consumed by balancing the equity in the house, or that the money she gets cannot be realized without significant tax consequences. Parties to a divorce don’t realize child support is until 21 in Mississippi. They don’t know the types of custody, or what each type means. They agree to things that they cannot legally agree to and fail to consider the consequences. Finally, one party is convinced to see an attorney and when they do they realize the consequences of what they were about to agree to and back out, the other side becomes angry and un-agrees too. All of a sudden a simple divorce becomes complicated, expensive and adversarial. Want to keep your situation from going from No Fault to Yo’ Fault? Have an assessment with an attorney that practices family law, keep the peace, and be smart. 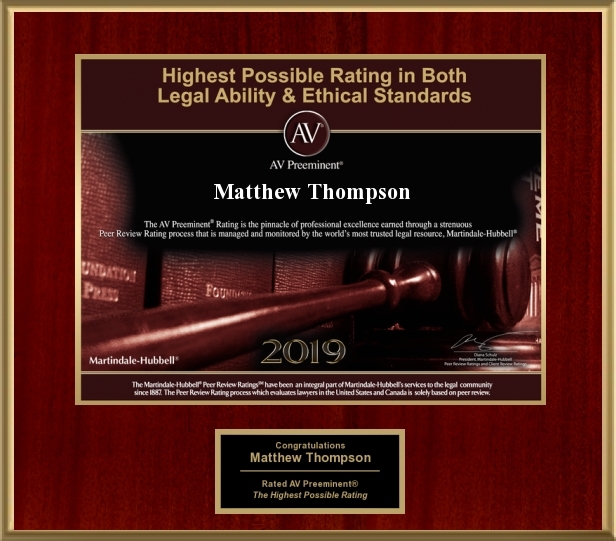 Matthew Thompson is a family law attorney that can handle your divorce whether it’s your fault, their fault, or somebody else’s fault.